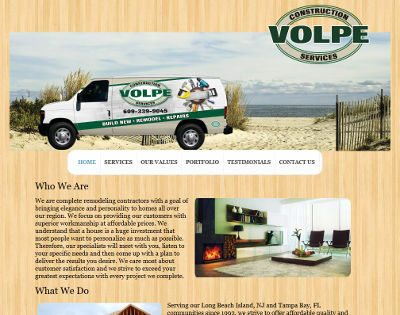 John, the owner of Volpe Construction Services, contacted us in need of our website services – including website hosting, domain name, and a website design. After obtaining the info from him on how he wanted the website to look along with the pictures and text, we started on the site right away. Within 48 hours of starting the site, we had completed the site to his satisfaction. John sent an e-mail saying “Wow, two thumbs up!”. We appreciate the business from John, and he noted that he will most likely have us create an animation at the top of the site and also have us do some SEO work from him. John’s website is at yourcoastalbuilder.com.